As part of the Burg Blog's ongoing "Meet the Faculty" series, we invite you to get to know Dr. DeMisty Bellinger-Delfeld. 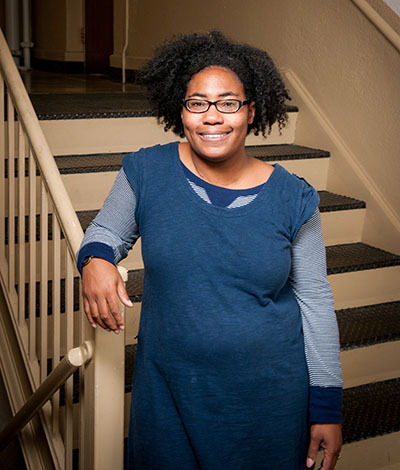 Dr. Bellinger-Delfeld has taught numerous courses in the English Studies program, from Poetry Reading to Creative Writing, and her fiction has appeared in magazines such as WhiskeyPaper and Kalyani Magazine. Tell us where you completed your academic studies. I completed my undergraduate degree at the University of Wisconsin-Platteville, and went on to receive my masters in creative writing at Stony Brook Southhampton College in New York. I then received my Ph.D in english, professional writing from the University of Nebraska-Lincoln. My interests span several areas of literature and poetry, including Women’s Lit (20th – 21st Century), especially women of color, African-American literature (20th – 21st Century), as well as fiction and poetry (both writing and pedagogy). I'm also fascinated by working class issues in fiction and poetry, especially 20th and 21st Century. What attracted you to Fitchburg State? Before I came to Fitchburg, I did a lot of research on the campus and the city, of course. I liked that the town is relatively small but diverse and that it is connected to the surrounding communities. I loved that the campus is small and that it seemed to live by and uphold a liberal arts education. When I came for an interview, I was overwhelmed with kindness. The support staff and the faculty in the English Studies department were helpful and friendly; members of administration were accommodating and friendly; and the folks at the hotel were kind. But what really got me interested in Fitchburg was the enthusiasm of the students in Dr. Steve Edwards’ creative writing classroom. They were interested in the lesson I shared with them and produced, in a mere fifteen minutes, some great poetry. Ultimately, the students are what attracted me to Fitchburg State University. What have been your impressions of the campus community in your time so far? People are so friendly here! It wasn’t an act put on for the sake of my initial visit here; FSU staff, faculty, and administration truly want their students and their coworkers to succeed. The helpfulness and kindness are not what I expected coming from the Midwest to the East Coast, but there they are! The students want to succeed, too; they work hard inside and out of the classroom. Please describe your approach to teaching, and what you believe makes an effective undergraduate professor. I believe a lot of teaching involves learning and listening. I have to stay on top of developments in my field (and other fields within reason, since writing is involved in every discipline). I have to listen to what my students respond to in class and in their work to understand how to meet their needs. Learning and listening make for relevant work in the classroom. For me, an effective undergraduate professor addresses the needs of her students while maintaining the requirements of the class. Also, all work she does in the discipline, including her own research, should be done with an eye towards her students. But, I don’t think this is applicable to all teachers and all fields of study. I think each professor has his or her own way to exhibit efficacy in the classroom. Anything else you would like the campus community to know about you? Feel free to visit me during office hours. I love to talk about books and about writing! Dr. Bellinger-Delfeld's office hours during the spring 2015 semester are Wednesday 11-12:15, and Friday 11-12:15.